ANAHEIM, Calif. – Josh Hamilton doesn't know where he'll play next season. That, or he won't say. Probably the former. He's been going pretty steady at this one-day-at-a-time thing, and it's served him well enough. None of it is perfect, of course. But Hamilton has a way about him that convinces us he'll get it right again, that he'll be the best man he can be today, and then maybe knock out a couple hits and run down a ball in the gap. Tomorrow? That's for tomorrow. His agent and the Texas Rangers have kicked around some very general ideas for what might be next, but those conversations haven't included Hamilton, and that's by design. It's still today, after all, and with any luck their plan is to ride a bunch of todays into early November. The reasonable assumption is that the Rangers will find a way to keep Hamilton in their outfield for another four, five, six seasons, and that Hamilton would have a preference to stay. The organization and the manager and the player seem to fit, as do the player and the city. The only guarantee in free agency, however, is there are no guarantees. For one, there is no other Hamilton in this winter's class. Not even close. For another, there are very few Hamiltons anywhere out there. So, he can be part of Tom Ricketts' plan in Chicago, or Dave Montgomery's rebuild in Philadelphia, or Peter Angelos' transformation in Baltimore, or John Henry's apology in Boston, or Ted Lerner's world dominance in D.C. Could he be Jerry Reinsdorf's momentum in Chicago? Or Larry Baer's offense in San Francisco? Arte Moreno's revenge in Anaheim? Mike Ilitch's accessory in Detroit? Liberty Mutual's subsidiary in Atlanta? Hank Steinbrenner's luxury-tax buster in New York? Hamilton could be any of those things. All of them. "Wherever I go," Hamilton said Tuesday afternoon, "God's going to be there, my wife's going to be there, my kids are going to be there and Shayne's going to be there." Shayne is Shayne Kelley, Hamilton's – let's say – adviser. He's been called an accountability partner, a counselor and a staff assistant. And he's a reminder that Hamilton comes with more than just his God, family and five tools. Whether Hamilton will be any more sentimental than that is difficult to say. The Rangers have stood by him during some trying personal moments, and Hamilton has repaid them with his bat and glove. The relationship has worked, which doesn't mean a new one in, say, Baltimore wouldn't. But, there exists the opinion Hamilton is fragile in that way and therefore better off cocooned in Arlington. Hamilton himself seems to believe that's a load of stuff. "People talk about, 'It's complicated,' " he said. "I don't get it. I provide a service. I get paid for it." 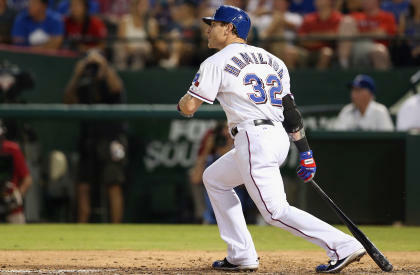 The return for the Rangers is again a player who is MVP worthy, who this season will play about 150 games and with two weeks remaining has 42 home runs and 123 RBI, in spite of an entire month he spent battling tobacco withdrawal and therefore, he said, batting less than .200. He is 31 years old and, according to one veteran scout, remains the player he described as "in the top two or three most talented ballplayers I've ever seen," adding, "He still gets down the line in 4.1 or 4.2 [seconds] and still finishes every play in the outfield. He's the same guy." There are complexities, though. Hamilton put his body through far more than the game ever could. Injuries cost him at least a month in each of the past three seasons. He left Tuesday night's game in Anaheim with what was described as "sinus issues." Scouts and general managers wonder if the time Hamilton missed in his 20s is gone forever or might be recouped at what otherwise would be the end of his career. Did he save his legs, his bat speed, his reflexes? Did he spend them? He will not be the most expensive free agent ever, but he is among the most interesting. Baseball certainly believes in Josh Hamilton, it simply doesn't know for how long it should. "I want to do it 'til my body says I can't anymore and my mind says enough's enough," he said. "I'll go when I'm not as sharp, not as quick, not as strong, not as agile." Even now, Hamilton said, that seems forever away. In some ways, he's just getting started. "I love playing the games," he said. "I love the frustration of it, because there's no perfection in it. You know, I love to hunt deer. There are some days I don't feel like going, but I get up in the morning and I go into the woods, because that might be the day that old big boy might show up." 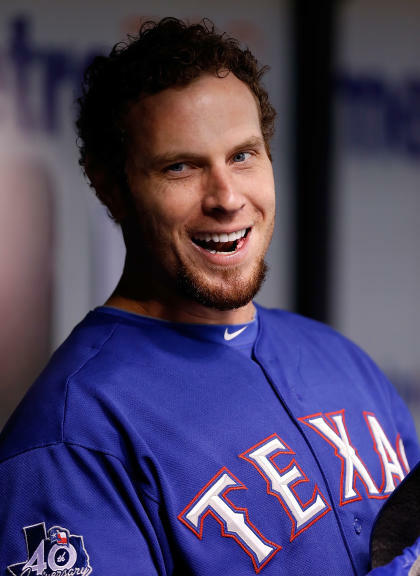 That's enough to get Josh Hamilton through today. It'll probably carry tomorrow, too. He'll know when it comes. "You never know what's out there," he said.